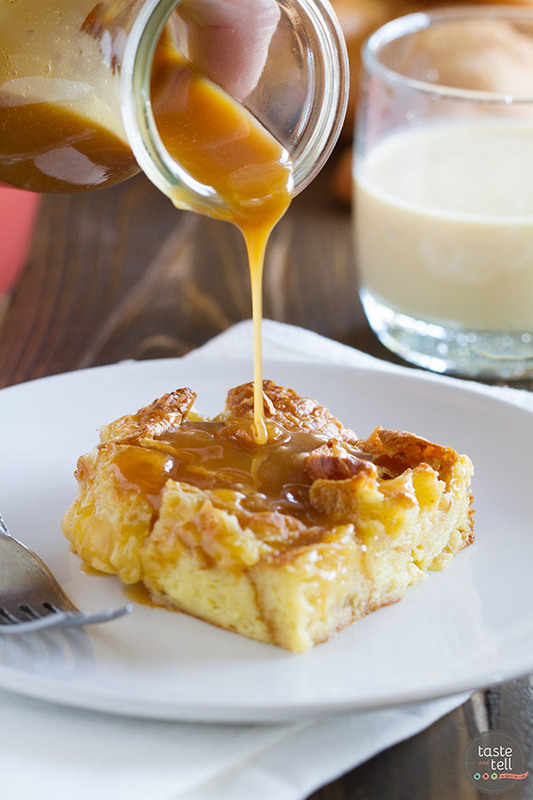 Transform your eggnog into this Eggnog Croissant Bread Pudding with Caramel Eggnog Syrup. Great for a decadent breakfast or as a special dessert, this bread pudding is melt in your mouth delicious! November has its pumpkin, September has its peaches. December though? One of my favorite December flavors is eggnog. 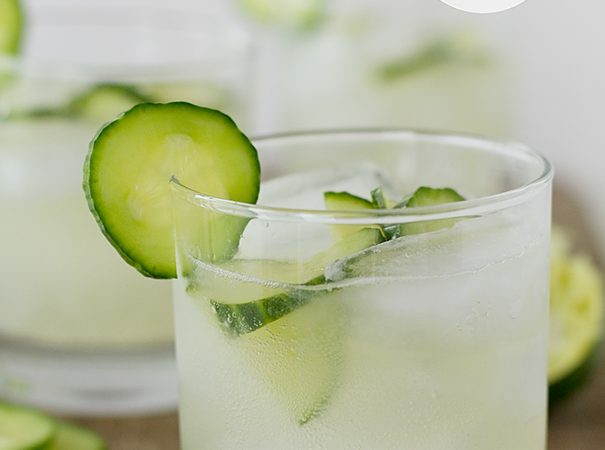 It’s so funny, because I don’t really love to drink it, but to bake or cook with it? I can’t get enough. I had picked up some eggnog at the store for another recipe, but didn’t end up using it. But every time I went to the fridge, I saw it there staring at me. Finally, when the expiration date was creeping up, I decided I needed to do something with it asap. And that is when this Eggnog Croissant Bread Pudding was born. I have actually been carrying around a recipe that I printed out years ago for French toast made with croissants. So when I thought bread pudding, that recipe popped into my mind, and I knew I had to try the buttery croissants with the eggnog. And since I still had some eggnog left, I decided to really take this over the top with a Caramel Eggnog Syrup. 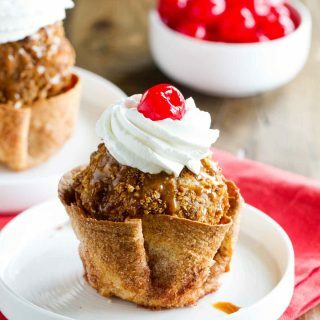 I know that bread pudding is normally classified as a dessert, but something about this screams breakfast to me as well. 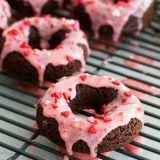 Definitely not an every day breakfast, but this would make a perfect holiday breakfast!! 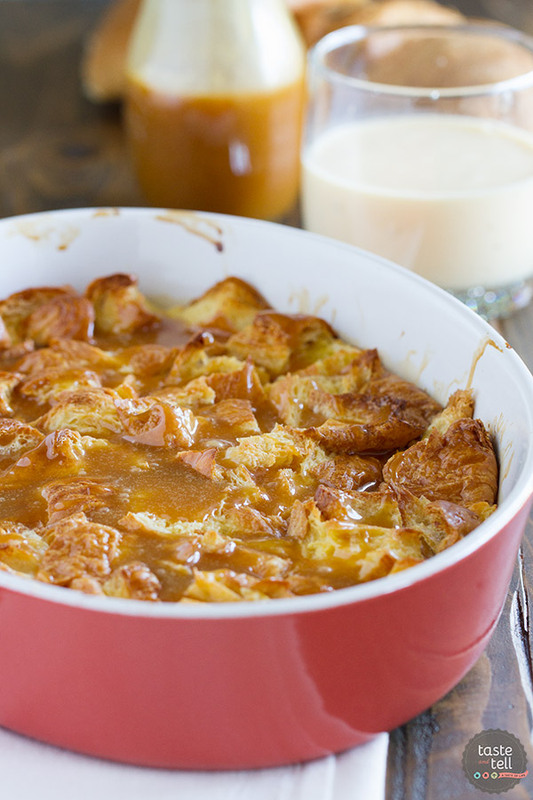 This Eggnog Croissant Bread Pudding is actually pretty easy to put together. It’s a great way to use up day old croissants, if you happen to have some on hand. If you have never had a bread pudding before, you make a sauce out of eggs and milk or cream. The eggs give it a rich, custard-y texture that can’t be beat. And instead of milk or cream, I added eggnog. It was a great switch-out for the milk. And then you get a double dose of eggs, which gives it that luxurious texture and makes it so, so good. The Eggnog Croissant Bread Pudding is pretty amazing on its own, but last year, I discovered how good eggnog and caramel are together. So I had to do it again. I took a basic recipe for caramel syrup, and added in eggnog for the liquid. Since eggnog already has sugar in it, I tried to cut back on the sugar in the recipe, afraid it would be too sweet, but the syrup didn’t thicken up like it should. So I went back to the drawing board and ended up using the full amount of sugar. And while the finished syrup is sweet, it’s not over the top sweet, and actually paired perfectly with the Eggnog Croissant Bread Pudding. 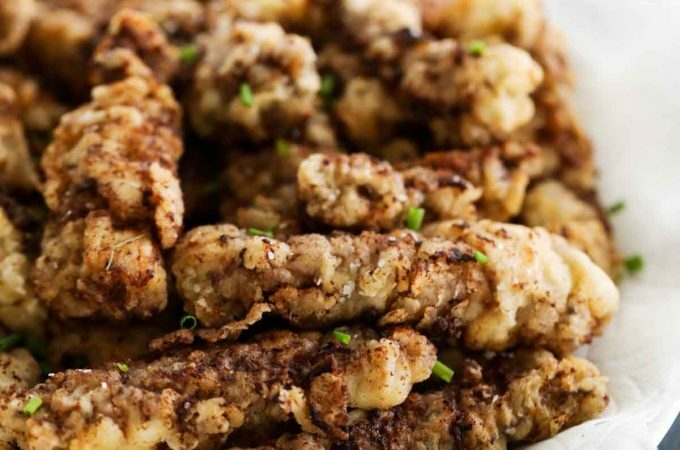 This may go down as my favorite holiday recipe from 2015! 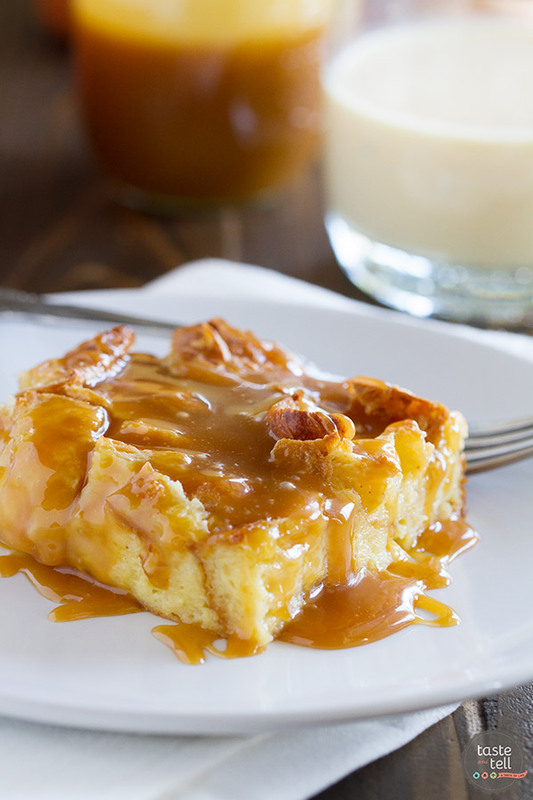 Transform your eggnog into this Eggnog Croissant Bread Pudding with Caramel Eggnog Syrup. 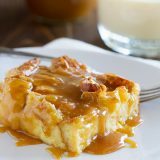 Great for a decadent breakfast, or as a special dessert, this bread pudding is melt in your mouth delicious! Preheat the oven to 350ºF. Spray a 2-quart baking dish with nonstick cooking spray. Cut the croissants into cubes and place in the baking dish. Crack the eggs into a large bowl and lightly whisk. Add the eggnog, sugar, vanilla extract, rum extract and nutmeg and whisk to combine. Pour the egg mixture over the top of the cubed croissants. Lightly press the croissants, making sure all of the pieces are soaked in the egg mixture. Let sit for 10 minutes. Bake the bread pudding in the preheated oven until the center is set and the top is golden brown, 30-35 minutes. While the bread pudding is baking, make the syrup. Melt the butter in a large saucepan. (You will want to make sure you use a larger saucepan, as the mixture will bubble up when you add the eggnog, and again when you add the baking soda. I use a 3 quart saucepan.) Add the sugar and stir until the mixture turns a caramel color, 6-8 minutes. 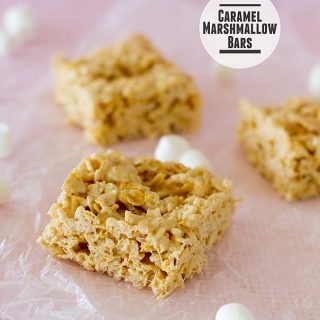 The mixture will look like it is separating – don’t be alarmed. When the mixture is golden brown, slowly whisk in the eggnog. The mixture will bubble up and may seize, but just keep whisking. Bring the mixture back up to a bubble and boil for a minute or two. Remove from the heat and whisk in the baking soda. Let the syrup cool slightly before serving. 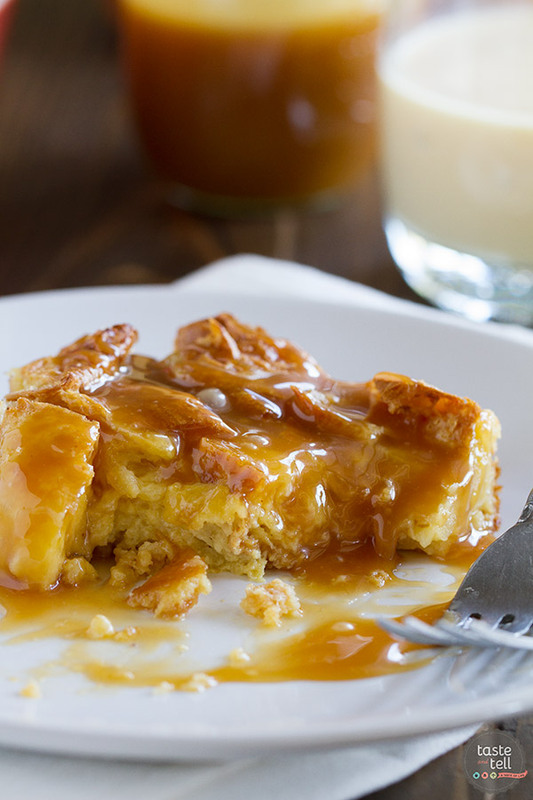 Serve the bread pudding warm, topped with the caramel syrup. The syrup will thicken as it cools. If it gets too thick, just warm it back up to thin it back out. I am in a working relationship with the American Egg Board, and this post has been sponsored. America’s egg farmers launched the good egg project to educate Americans about where eggs come from and encourage people to eat good and do good every day. They are committed to doing what’s right for their hens, the environment and their communities and are proud to provide Americans with affordable and nutritious food. Visit http://www.incredibleegg.org/good-egg-project/ to learn more. I’m so glad to be able to work with companies and organizations that I truly believe in. Thank you for supporting them, too. Also follow along with #recipeeggchange for all kinds of great holiday recipes! 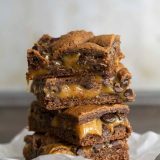 Another beautiful recipe. Thank you. OMG!!! Thank You!!! 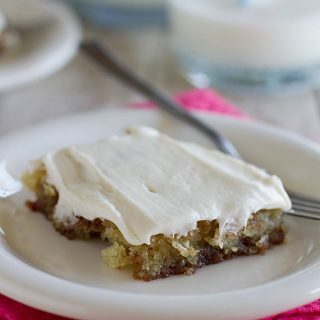 We love Eggnog Anything and this Will be on our Holiday Menu! Eggnog, in my opinion, is gross for drinking and best for baking!! Oh how i would love to wake up to this! Eggnog mixed into yummy breakfasts, the flavors can’t be beat! Plus this syrup! My goodness it does sound amazing! Seriously – I wanted to just drink the syrup! Oh boy I think I just changed my Christmas morning plans! This has got to be the BEST bread pudding ever! That syrup looks divine! Oh my gosh I’m drooling!! 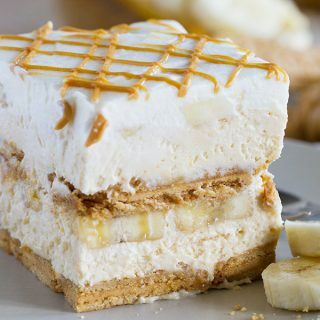 This looks amazing Deb! 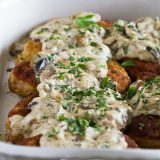 I really wanted to make an eggnog French toast casserole this winter, but never got around to it. This bread pudding looks very bit as delicious as what I had in mind. I made it and it was runny. It almost seemed like the egg didn’t cook all the way. Tips? What did I do wrong? If it was runny, you might have just needed to bake it a little longer. It should still be moist in the middle, but not runny.